If you're going to get in shape, you need to move, and nothing wants to help you move faster than the Sirrus with powerful hydraulic disc brakes. It takes a no-nonsense approach to its design, giving you everything that you need, like superior braking, and nothing that you don't. If youre going to get in shape, you need to move, and nothing wants to help you move faster than the Sirrus with powerful hydraulic disc brakes. It takes a no-nonsense approach to its design, giving you everything that you need, like superior braking, and nothing that you dont. Its constructed from a durable, reliable, and lightweight A1 SL Premium Aluminium, and it features a reliable set of components that are built to withstand years of daily abuse, hydraulic disc brakes that provide reliable stopping power in any condition, and comforting Body Geometry touch points that are sure to take the sting out of long rides. Complacency just met its match. > Working with their Body Geometry team, Specialized designed a frame that strikes the optimal balance between comfort and efficiency. The A1SL Premium Aluminium construction pairs weight savings with rugged durability, while the rack, fender, and disc mounts give you an incredibly versatile package. > A steel, straight blade fork provides a responsive ride, while the fender and rack mounts give you the option to install rain-fighting fenders and racks that can transport your gear around town. > Promax F1 hydraulic disc brakes are specd on this Sirrus to ensure consistent, powerful braking. 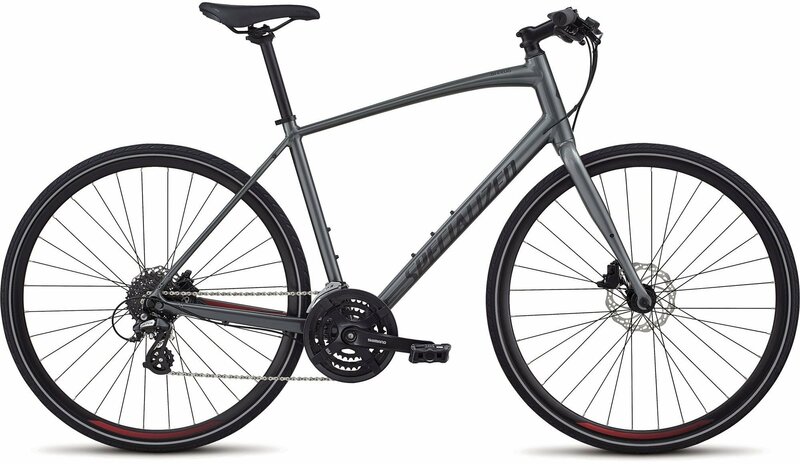 Please see below for delivery options for Specialized Sirrus Alloy Disc City Sports Hybrid Bike 2019.